There’s not much more I love than a good gingerbread man. But then I discovered gingerbread yogis and my whole world changed. 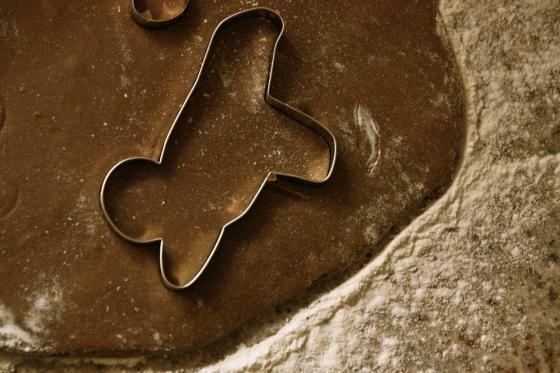 You see, I’m in charge of baking Christmas cookies for a family event at the studio this weekend and Anna ordered these cookie cutters for me to use. I nearly cried. I mean, how cute are these? How perfect? She gave them to me yesterday after yoga, and I was too excited to wait. I had to try them out and I knew the perfect cookie to make. Thick, chewy and spicy gingerbread cookies. 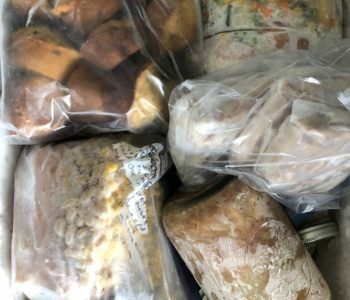 The kind your grandma made and the kind you get from artisan bakeries, sprinkled with coarse sugar. Dare I even say the kind that Pa brought Laura and Mary? Or would that be going too far? 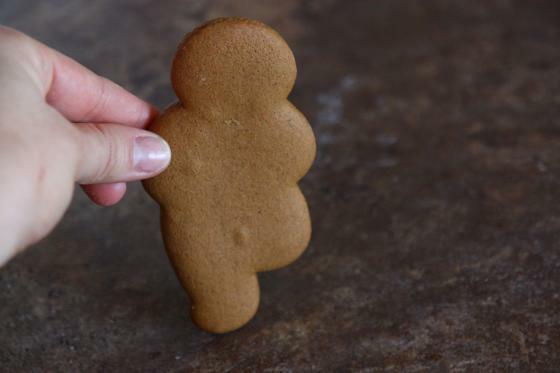 I hate to say it—hate to go there—but I’m really sort of a gingerbread snob. It’s been my favorite cookie forever and I know what I like (and don’t like). 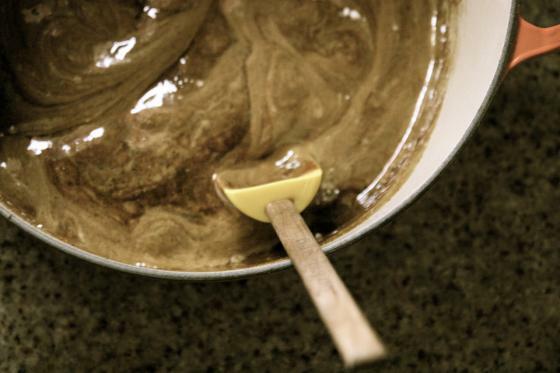 I know I like a lot of molasses, brown sugar, ground white pepper (secret ingredient! ), butter and tons of ginger. I hate it when people skimp on the ginger. I mean it’s gingerbread for crying out loud! These particular gingerbread cookies are made the old fashioned way, by boiling together the molasses, sugar and spices on the stove and then adding the baking soda, butter, egg and flour at the end. 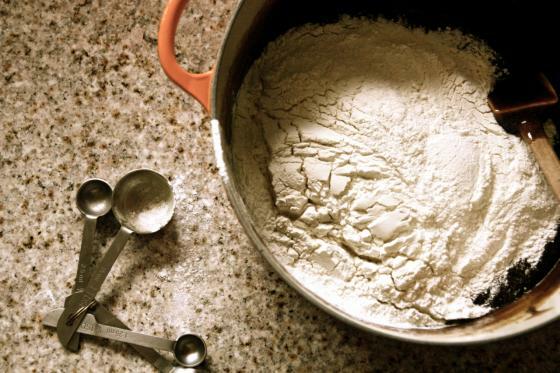 No mixer needed and there’s just something fun about adding baking soda to boiling sugar. You also don’t chill the dough in this recipe, which is always a good thing because who has time for that? There’s no telling when a cookie craving may strike, and it’s always good to be prepared so you can act fast. If you missed the initial link, Anna got these cookie cutters here. Sadly I’ll be returning them to her, but only after I perfect a recipe for vegan sugar cookies so the kiddies can have something to decorate on Saturday after their yoga class. I think my favorite is downward facing dog! I ate this one first. I have to say, the only way these cookies could possibly be cuter is if I decorated them with Lululemon frosting clothes. I mean, how cute would this gal be dressed in a pink power-y tank and groove pants? 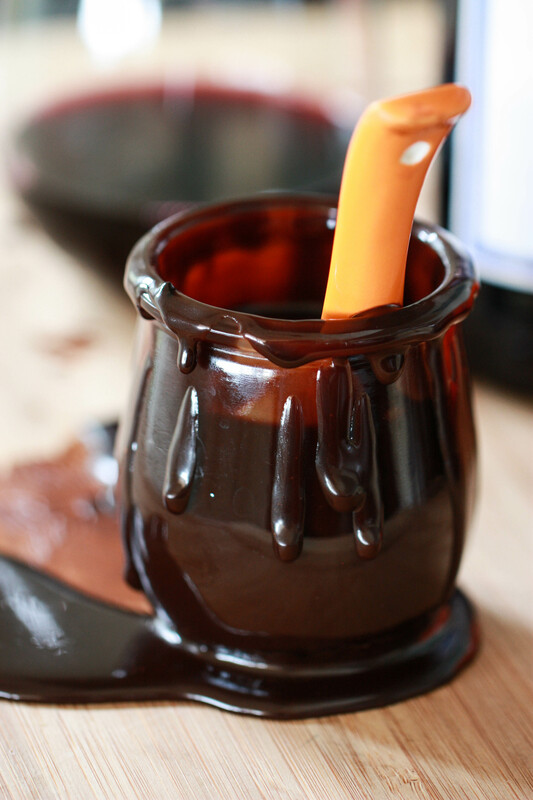 Combine the brown sugar, molasses, ground cloves, white pepper, cinnamon and ginger in a large heavy-bottomed pot. Bring to a boil on the stove for about three minutes, stirring occasionally. Take pot off the stove and add the baking soda (this is the exciting part!!!). Stir well. Add the butter, adding only a few chunks at a time and stirring well so each addition melts before the next. Add the egg and stir. Finally, add the flour and salt. The dough will be very soft and still warm, but roll out on a floured covered surface. 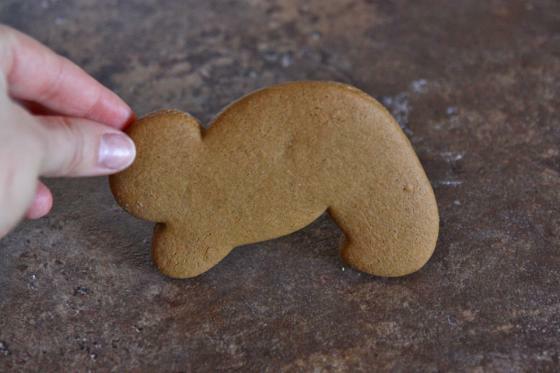 Cut with cookie cutters or use a large glass to make regular shaped cookies. hahaha those cookie cutters are adorable!! Decorating gingerbread men is one of my favorite holiday activities. The gingerbread yogis sounds even more fun! Oh how cute are those cutters?! I am not a huge fan of gingerbread cookies alone, but my husband loves them. And white pepper in these?? I just may need to try! OMG those cookie cutters are to die for!!! And your gingerbread looks so yummy. I need to get my hands on those cookie cutters! So freakin’ cute! ohmy goodness! this tops it all!!!!! 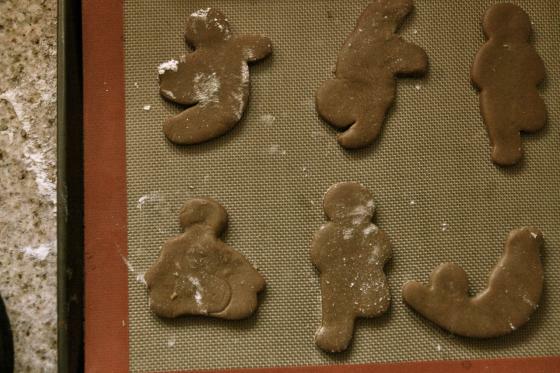 I’m also excited because today is another christmas bake-a-thon in my kitchen… and I was just googling gingerbread men! because, yes, I too am a gingerbread snob. Sad fact. Are these chewy? or crispy? I don’t like crunchy gingerbread men…they’re just not my type! i also loved the iced version of the cookies on the website! Oh my word. Want, no need, MUST HAVE those cookie cutters. That is sooo awesome. And I bet they taste phenomenal too. Little down dog Gingy is doing it better then I do my down dogs. Jealous of a gingerbread man, who would have thunk it. At first, I totally thought they were the ninja gingerbread men cookie cutters (http://www.amazon.com/Fred-Friends-Ninjabread-Cookie-Cutters/dp/B003YUBQHO). It’s not a matter of wanting those cookie cutters for me right now. It’s become essential that I possess them. I’m putting them on my wish list! Great find, thanks for sharing!! Oh my goodness, those cookie cutters are absolutely adorable!!!! 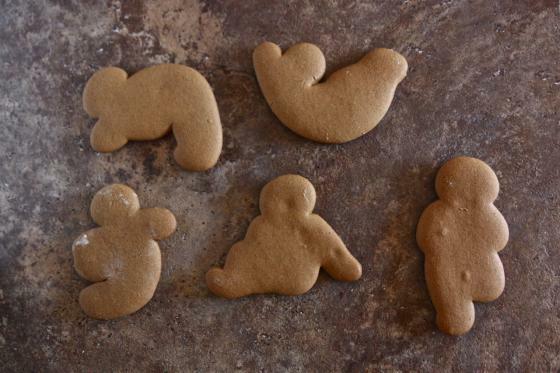 I love these gingerbread yogi shapes! Could they be any cuter? I think not. Aw those are adorable! Where’d she find them? So cute, Best cookie cutters ever! I like this low maintenace recipe too. Those are the most adorable cookies *ever*!! I wish that store shipped to Canada!! I’m a first-time commenter but I have enjoyed your blog for a while. 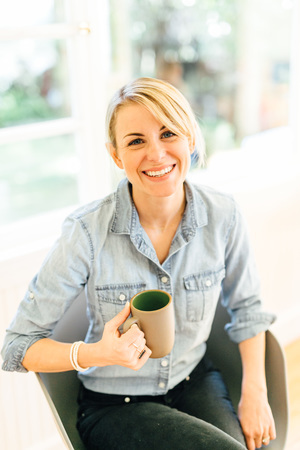 I love your new approach to blogging and how you share your love of baking/cooking. For me, I enjoy this type of blog so much more than seeing bowls of oatmeal, but that’s just me, a lot of people obviously enjoy pics of oatmeal! I need those cookie cutters!!! Ahhhh these gingerbread men are ADORABLE!! I am newly obsessed with all things gingerbread, molasses, and ginger. I can’t get enough of it. If I had cookies this cute, they wouldn’t last a minute! I love gingerbread cookies! And those cookie cutters are so cute it’s ridiculous. OMG I LOOOOVVVEEEE those cookie cutters!! What will they come up with next? Tree pose is my FAVorite. Oh my word. It’s hard to believe, but I own NO cookie cutters. What is my problem? 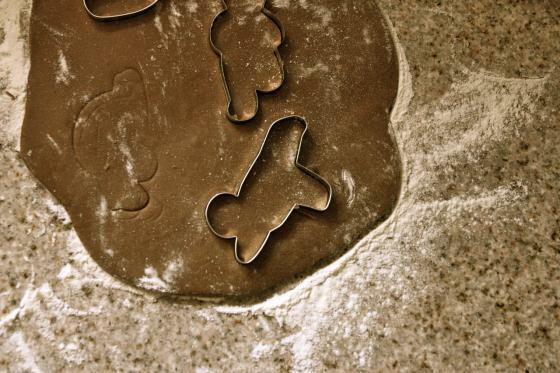 I really want little animal cracker sized cookie cutters to use with my homemade grahams! These have to be the CUTEST cookies I’ve ever seen! I would buy these cookie cutters in an instant if they weren’t $32! I can’t even handle how cute these are! I put them on my Christmas wish list immediately! So adorable! OMG! I think we’re on the same wavelength right now! I saw these cookie cutters earlier this week and nearly died! I love them! I’m actually writing about them in my blog post for tomorrow. I hope you check it out! I’ll be sure to reference your pics and post as well. These cutters would also make some cute PB&J sandwiches! I love those cookie cutters! Oh man, thats precious. I love gingerbread. I’m Swedish and my family always has this type of gingerbread cookie called pepperkaker, I look forward to it every Christmas..
How adorable! I love how the one in tree pose looks like an amputee. OMG! Those are the cutest cookies I have EVER seen. I would love to see them decorated. Where can I get my hands on cutters like that! Those are the cutest cookie cutters EVERRRR! I once had a set of “Noah’s Ark” cookie cutters that I’m so sad I lost. I love fun cookie cutters! Cute idea, though before you told me that’s what they were I had no idea! So glad you did gingerbread men! I love them. And yogis…how adorable! Another holiday (?) cookie I love is chocolate crackles w/ powdered sugar on top. Melt in my mouth. I have never done yoga in my life, but I still think these are so cute! Your recipe sounds so intrigueing. I had one planned for this weekend, but maybe I’ll switch to try yours! Hi Jenna! I met Anna at a Baptiste bootcamp this summer and she also introduced me to these cookie cutters. I can’t wait to use them! I am hosting a Christmas party for my yoga students and plan to give treat bags full of gingerbread yogis as favors. So excited! Seriously, does it get any better when jolly gingerbread cookies come in yoga poses? And I’m with you on decorating them in lululemon gear. Too cute! Oh my gosh! These cookie cutters are precious! Gingerbread cookies are my favorite type of Christmas cookies! And those cookie cutters are beyong words! these are adorable 🙂 and look/sound delicious too! Those are adorable! I love the shapes! Those are the cutest cookie cutters! I love gingerbread cookies so much that I have been known to eat an entire batch in one day. Look out I am a gingerbread man killer! 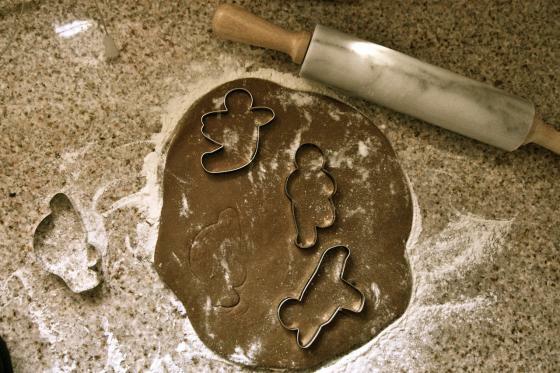 I LOVE these cookie cutters- so cute! I’ll have to order them so I can bring some treats to my yoga students. Thanks for the great idea! Fabulous!! I’m going to bake these today, thank you so much 🙂 they will not be as wonderful as yours though – I don’t have those adorable cookie cutters! Must get some, too cute for words. You solved a huge problem for me today! I told my students that I would bake cookies for their last day of class (Friday) and then realized that I didn’t know many recipes that made enough for all 44 of my students and I hate doubling/tripling recipes because it messes everything up. Then I saw your recipe! this makes about 60 (!!) round cookies. Thanks! Jenna, I’m sure it’s good baked, but straight from the can isn’t TJ’s canned pumpkin unpleasant to taste? Ive been obsessed with those cutters since I saw them on a yogi gift guide a few weeks ago, so cute! I just bought both sets of these cutters – I just couldn’t resist! I can’t wait to bake some gingerbread yogis for the girls at my studio! Do you have any suggestions for what kind of icing to use for piping along the edges? I also LOVED the cookie cutters and my nice husband purchased them for me as an early Christmas present. The best icing for piping appears to be Royal Icing. Use the version the has meringue powder not egg whites (salmonella issues). OMG those are SOOOOOO cute!!!!!!!!! i saw an advertisement for these cutters! so cute. This totally made me laugh out loud and I totally agree!! oh my word those cookie cuttersare the cutest! I absolutely LOVE these cookies. I made some to give away as holiday gifts the other night, unfortunately I didn’t have any yogi-cutters…just regular old men, snowmen and trees! They’re still amazing. Thank you so much for the GREAT recipe, I only made one or two substitutions…take a look and let me know what you think if you get a chance!! it gives it a little kick…try it! I swear white pepper is the secret in all delicious gingerbread.